Brandy has successfully completed the Artist as an Entrepreneur Institute put on by Broward Cultural Division and ArtServe. The powerful voice behind my paintings is that of my spiritual side. All people are equal. We are here aspiring to love and be prosperous, so lets do this in harmony. Creating art that provokes a positive and deepening emotion is important to not only my soul but the soul of the viewer. Im a firm believer that we must surround ourselves with art that is moving and thoughtful rather than dark and depressing. Where we are going as humans should be that of positivity and happiness rather than receding to the depths of negative humanity. 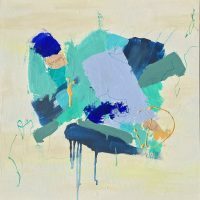 Brandy Lynn Magill was born in Syracuse, NY and raised in Chugiak, Alaska. She learned to paint at a very young age from her Grandmother, and excelled best in music and art classes. 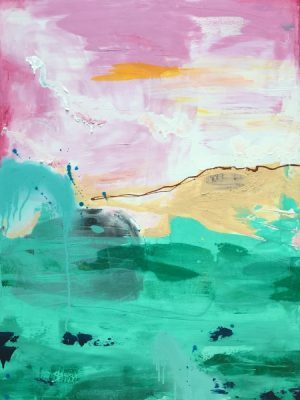 Inspired to discover a bigger city, she moved to Fort Lauderdale, Florida at age 20 allowing her to explore various artistic outlets. She studied fashion and quickly turned to fine art painting. She studied at The Academy of Art online for a BFA in Painting. Brandy currently resides in South Florida where her studio is located. She is a mother to her son born in 2014. The strength it takes to be a parent/mother pushes her to grow and develop as an artist and in her yoga practice. To create an environment where positivity thrives through color and creativity is very important in her daily life. You can see this application in her paintings and subjects. Brandy is a firm believer that happiness and positivity can come from both Yoga and Art. The combination of spirituality and art is at the core of Brandy’s paintings.